Blog How Do We Know The Bible is From God? Does the Bible actually claim to be the very Word of God? More importantly, can it be proved to be with certainty, God-inspired? These are questions we should be willing to investigate for ourselves. Challenged by a conversation with a colleague along these same lines, Barry Cooper, co-creator of the evangelistic teaching course Christianity Explored, set about the task of proving the Bible's trustworthiness. His new book, Can I Really Trust the Bible? And Other Questions about Scripture, Truth and How God Speaks, is the result of his exploration. Cooper thoughtfully reflects on his own walk, through which he was drawn closer to the Jesus Christ of Scripture. 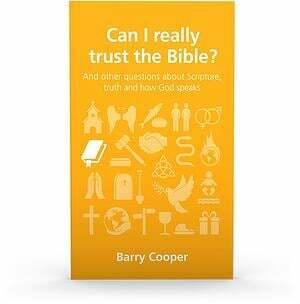 Taking on challenging questions like, “What’s inside the Bible?” and “Doesn’t this argument just go around in circles?”, Cooper takes readers on an important journey into topics that have clear answers.